I speak here, of course, in reference to the fond depiction of my favourite 1970s-era rock bands on the cover of my CD “Retroid Rock”, issued to commemorate my inaugural lecture in 2002…what was that? Never seen it? 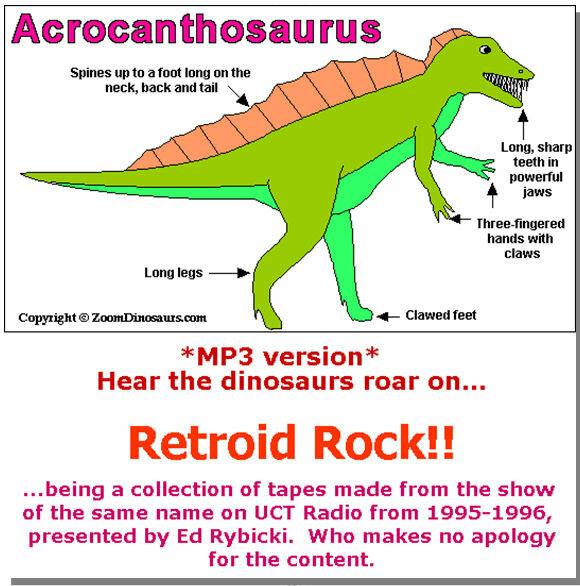 As you were, then…OK, it had an Acrocanthosaurus on the cover, said “Hear the Dinosaurs Roar!” on it in large red letters, and had 13 hours of taped radio shows I did between 1994 and 1995 on UCT Radio (104.5 FM – in stereo…). Available for a limited period only…actually, that’s a lie, you can still get it from me…. Anyway, what I mean to do, in my typically long-winded way, is to compare the bands that I saw last night at the Grand West Casino in Cape Town to the over-large and undoubtedly noisy dinosaurians that have departed us, lo, these many aeons gone by. Except they haven’t, obviously, if we saw them last night? Enough of this: the family Rybicki-Williamson betook themselves last night – with various members wearing Pink Floyd, Stones and Zeppelin T-shirts – to the aforementioned Masters of Rock concert, featuring Wishbone Ash and Uriah Heep, supporting Deep Purple. Man, that boggles the mind: the folk who crafted such masterpiece albums as “Very ‘eavy, very ‘umble”, “The Magician’s Birthday”, “Fireball”, “Machinehead” and ummmm… whatever it was Wishbone Ash did, LIVE!! In person!! Or most of the persons. Well, SOME of them, anyway: thus it was that Deep Purple still (or again) has Ian Gillan on vocals, Roger Glover on bass, and Ian Paice on drums, with Steve Morse added on lead guitar and Don Airey on keyboards. Uriah Heep – well, they’ve had more line-ups than the average police station, and the only survivor from 1969 is Mick Box on guitar and vocals; however, Bernie Shaw (vocals), Trevor Bolder (bass) and Phil Lanzon (keyboards) have been around for twenty-four years now, with Russell Gilbrook joining in 2007 on drums. Wishbone Ash…never actually knew who was in WA; however, Andy Powell is still doing guitar and vocals; Bob Skeat does bass, Muddy Manninen another guitar, and Joe Crabtree is on drums. Starting with last, WA seriously impressed me: I only remember one song they did – because it’s on my MP3 player – so it was like listening to a new band, and they did well. Really tight, really good harmonies, good voice – and really good guitar, swapping leads between Powell and Manninen without missing a note. They even managed to make the wimpy “Blowin’ Free” sound good live – and played a solid hour. Andy Powell mentioned during the set that “…this band goes back forty years!” Then after a look at the audience: “…and so do some of you…”. Uriah Heep: now there’s a bunch of dinosaurs…hardly an original-coloured hair among them; seeing a bunch of white hairs rock like that gave me hope for my declining years. But they were just too frikkin’ loud! Oh, they did “Sunrise” and “Easy Living” and even “Lady in Black” – but then they mixed in new stuff (! ), and there was so much white noise in my head I couldn’t make out the words to anything. And there was no “Magician’s Birthday” or even “The Wizard”, so they lost some points in my book. They are also in their fortieth year, apparently, so look for commemorative albums any time now. And finally, The Purple…damn, but they were good. Mind you, Roger Glover looks like a little old biker; Ian Gillan looks like a banker; Ian Paice is a bespectacled grey ponytail – but Steve Morse rocks, serious. He looks like a refugee from The Spiders From Mars, but hey, it’s a 70s-era band – and the man can play guitar very, very well, as well as being able to sound like Ritchie Blackmore when it matters. DP went on for a good hour and three-quarters; their encore alone was a good 15 minutes – and included the best rendition of “Black Knight” I have ever heard. The sound was also way better than for Heep, so one could actually listen – admittedly, while your diaphragm vibrated in sympathy to Glover’s bass. There was new stuff, and (to me) obscure stuff (80s releases) – but “Fireball”, and “Space Truckin'”, and even “Mary Long” – remember? a song mocking Lord Longford and Mary Whitehouse? “When did you lose your virginity, Mary Long…” – kept the seven thousand-odd audience jumping. And then they did “Smoke on the Water”…. Teenagers danced in the aisle. Balding men wept. Aging mothers screamed – sorry, that was me…. Did I mention the average age at this concert? Oh, 50ish – with the average kept in check by the fact that a lot of aging parents brought their kids, even if some of them did have beards (the kids, that is). The line at the men’s loo was longer than for the women’s – which I think may have had to do with prostates, but could also just have been the beer. My son – who is a connoisseur of live band shows in South Africa, and who has seen bands like Muse, 30 Seconds to Mars, Kaiser Chiefs and Panic at the Disco – said this was one of the best he had seen. My daughter (age 14 – exactly when I started listening to Purple) thought it was fantastic. Mind you, he is also a Zeppelin fan, and she picks out Cream songs on the piano, so they’re biased. But I tell you, for nearly five hours hours last night, dinosaurs walked among us. This entry was posted in Music and tagged classic rock, Deep Purple, South Africa, Uriah Heep, Wishbone Ash. Bookmark the permalink. Hey Gav: yes, well, we in the Deep South are not as well served as you Northrons…I could have seen the same line-up (without Wishbone Ash) 15 years ago, but I’d just seen Jethro Tull, and didn’t care – big mistake, obviously! So my score is: that Scottish pop band that came thru Salisbury/Harare in 1972 or so (Chirpy chirpy cheep cheep? ); Abdullah Ibrahim aka Dollar Brand; Juluka (2x), Savuka (=Juluka Mk II); Jethro Tull (Berlin 1990); Buddy Guy (US); A Ibrahim again; Jethro Tull (1994, SA); Juluka (2009)…and The Big Ones. next year you have to come to the Rory Gallagher International Tribute Festival, 3 glorious days of Rory cover and tribute bands, in Ballyshannon, Co. Donegal, (Rory’s birthplace). I have taken lots of photos and will show them to you next week! There are tribute bands from all over the world, and they uncovered a magnificent full size bronze statue of Rory in the centre of town on Thursday night. We took the kids along today, and The Mirenda Rosenberg band kicked off with some brilliant numbers, and it was great to see gnarled old grandads, plaited grey hair and Rory t-shirts, bopping alongside Jemima Jayne et al!